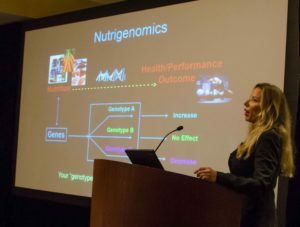 She offers presentation services on a variety of topics, with a specialization in “Nutrition for Athletic Performance” for all sports. Past Topics include: “nutrition to train hard & perform your best” (tailored to be sport specific), “eating to gain muscle and strength”, “genetic testing and the future for athlete development”, “diet and exercise recommendations to prevent osteoporosis”, “eating for health and energy”, “sport supplements for athletes & fitness enthusiasts”, “special concerns for the health of the female athlete” and many more. Presentations can be formatted to fit any age group – kids to the elderly – and any topic of interest to your organization can be researched and presented to your group. Rates for this service vary with seminar topic (prep time for “novel or specialized topics”) and location.